GO WITH THE RHYTHM OF THE LIGHTS , WATER AND HISTORY!! It is no longer just a far off dream to sail on the blue waters of the Mediterranean and discover its exquisite bays and islands... 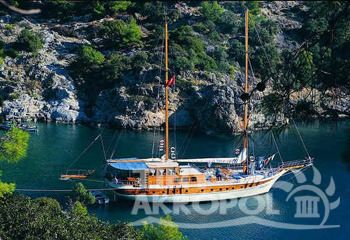 These beautiful sights which were known only by local sailors until 40 years ago are now easily accessible by sailing boat or traditional schooner by everyone who wishes to have an unforgettable holiday. You can either organize your own group and rent a schooner establishing your own route or share a boat with new acquaintances and join a blue voyage on a pre-established route. At stopovers you can expend surplus energy on various water sports, lie on deck beneath the Mediterranean sun, dreaming of new holidays and various routes in quietude. 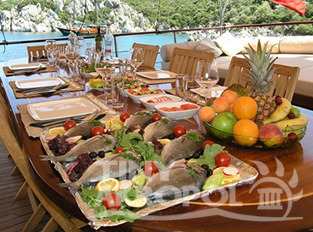 It is up to you to set the boundaries of your Blue Voyage starting at Fethiye to the north of the Aegean Sea and Eastern Mediterranean... You can start with the Göcek islands and bays on the Marmaris Route; you can visit the Tersane Island, Bedri Rahmi Bay (Lycian Bay), Manastir (Cleopatra's Bath) , Sarsala Bay , Boynuz Bükü and Ag Limani, reaching Ekincik and Iztuzu the beach of the Caretta Carettas or you can sail towards Antalya visiting Gemiler Bay, Gemiler Island (St.Nicholas Island), Bestaslar Limani - Soguksu Bay, Ölüdeniz, Patara, Kalkan, Kas and the sunken city Kekova. 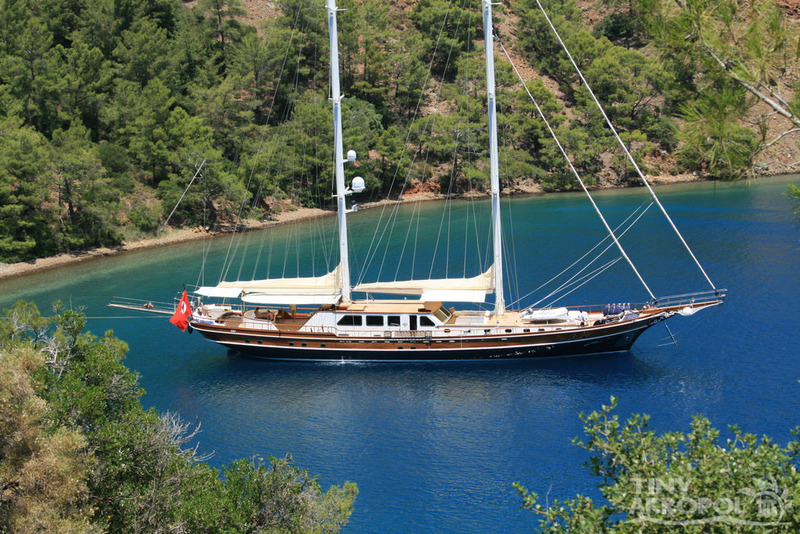 It is an unrivalled pleasure to voyage by traditional Turkish Schooners which are called gulet. These are built from chestnut, mahogany, teak and pinewood and offer good living space with their comfortable cabins, showers, toilets and plenty of space to relax. Different standards and various passenger capacities also provide you with plenty of choice depending on your holiday budget and for the preferences of your group. In addition to lying back and enjoying the peace and endless sunshine you can also take part in numerous energetic water sports such as scuba diving, waterski, parasailing, jetski, windsurfing, banana and ringo. For sailing addicts favourable winds, such as the late afternoon "meltem" offer the chance to blend spectacular surroundings with the utter tranquillity of a boat at sail in a unique combination. The Blue Voyage tempts you to a completely unique holiday experience bringing together the backdrop of a cultural heritage of thousands of years, spectacular scenery, and an on-board lifestyle centred around the sun and sea, good food, good friends old and new also complete utter as an unforgettable relaxation.